Imagine a dystopic world in which children haven't been born in 25 years. It's total chaos. With no one left to inherit the earth, the surviving humans have pretty much run the planet into the ground. 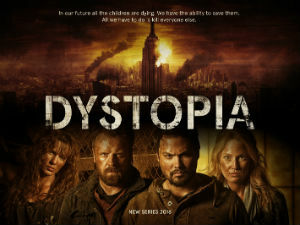 It's in this world that the new 10 episode series "Dystopia" unfolds. The series, with British director Paul Tanter behind the camera, stars Michael Copon and Sheena Colette as a pair of scientists who "stumble upon time travel and the opportunity to change their fate, but all is not certain as changes they make in the past have unforeseen life threatening consequences in their future." Basically, it's Children of Men with time travel. Along with Copon and Colette, the show also stars Eve Mauro, Leo Goodman, Peter Woodward, Al Sapienza, Jason Faunt, Leslie Lopez and Michael Madsen. I'm curious to see how the show comes together, particularly since the crowdfunding campaign from earlier this year didn't manage to reach its goal. With the project still forging ahead, I can only imagine that there is one or a couple of folks who have enough interest and faith in the project to fund it so that's promising. No information yet as to where the show will air but expect to see it in 2016. More details to come as production continues.